The Recession has taken a toll on America. Jobs have been lost and salaries cut all over. The city of Detroit, Michigan has felt it the worst of all. Thousands of autoworkers suddenly found themselves out of a job. For a city built on the auto industry, this is devastating. This was also compounded by a tanking housing market. People saw the value of their homes drop down to the price of a car. Some would say that Detroit is a cigarette burn on the skin of America; left there by Wall Street. I call this place home. I cannot deny that some parts of my home may resemble that remark. Many burned out homes still remain from past incidents. Next to vacant lots where homes once stood. Many abandoned business still line busy streets pointing to past glory. A ride up Gratiot from downtown to eight mile is a reminder of that fact. Downtown remains a hot spot in spite of everything. Giving citizens ample distractions from their individual plights. Stars still come and perform to near sellout crowds. Weekends downtown still hum with activity of all kinds. Sports are still big. Opening day at Comerica Park is always standing room only. Whether or not the Tigers win is over shadowed by a great time had by all. Red Wing Hockey games at Joe Louis Arena are still a hot ticket. I know what you”re wondering. How can a city hit hard by the Recession still maintain its daily routine as well as sports and entertainment? The answer is simple. We haven’t given up. Our streets tell our story. Every street here has potholes. A nice, leisurely ride can be interrupted by the force of hitting a pothole. Some are small and only provide a minor bump but others can be huge. Big enough to flatten tires and cause major damage. Life in Detroit is the same way. We have had major potholes here. Riots fueled by racial tensions in 1943 shook us to our core. We later relived those riots in 1966 and 1967. After the 1968 riot, Detroit was written off due to the amount of destruction. As a city, we didn’t give up and continued to rebuild. Hard working people overcoming hard times. Kwame Kilpatrick was another pothole. His scandal hit us where it hurt. Leadership! Leadership is key to all cities. Poor leadership can hinder the growth of a city for years and Kwame put us back quite a bit. His fall from grace happened at the worst possible time and was felt by all. Yet new leaders have emerged in Dave Bing and Robert Bobb. These two men are asked to make tough decisions in a time when tough decisions are needed. I can’t say for sure I agree with all that they propose yet tough decisions are always unpopular. Especially where change is needed. Our schools are going through one such change. The Recession has given some of Detroit’s most productive citizens no choice but to leave the state in search of employment elsewhere. Who could blame them? The mass exodus of people leaving for jobs elsewhere has reduced the number of children going to our schools. Giving Robert Bobb no choice but to close some schools. Prior leadership failed us here with investigations turning up rampant misuse of public school funds. Forcing more schools to be closed due to a broken budget. Adults like myself have returned to classrooms across the city. We realize the need for the training and education required to secure future employment. Now we set our sights on degrees and certifications instead of promotions. Road crews patch potholes on a regular basis and it is the same with us. We patched the potholes of the riots and got back to work by reducing burned buildings to vacant lots ripe for building. Vacant homes were rebuilt and sold as we remained prosperous working for the Big 3 automakers. 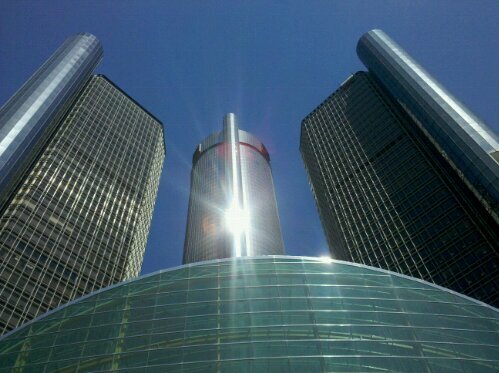 GM, Ford, and Chrysler grew as the city grew. In the process, we lost Motown Records to Los Angeles. Watching our Motown Sound go west was a huge emotional pothole to overcome yet we did it. Perseverance is something we have in abundance. This is my letter of recommendation for the city of Detroit. Cheap riverfront property suitable for any industry with thousands of people ready, willing, and able to work. Having survived countless obstacles to maintain a way of life, Detroit has proven itself built for the future. The people here share a bond of hard work and determination which has been forged for generations. We have extreme pride in our city which we shared with fans of the NFL during Super Bowl XL. It is also that pride that you see in the eyes of everyone here. Unbreakable under the weight of prejudice and bad press, we stand firm in our pursuit of prosperity. Posted on March 23, 2011 by KELLY GREENE	• This entry was posted in Places. Bookmark the permalink.